After visiting the Brandenburg Gate,a visitor to Berlin would think of visiting the Pergamum Museu.During this visit,s/he would watch the masterpiece of the Hellnistic Age the temple of Zeus with awe.Taking advantage of the weakness of the Ottoman Empire towards the end of the 19 th century,the German archaeologists carried the the temple to Germany.This temple gives us an idea how beautiful Pergamum was once upon a time. 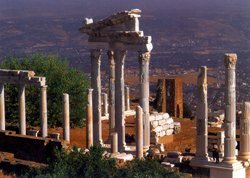 Pergamum is located on the fertile plains watered by the Selinus river, therefore many civilizations have settled here since the ancient times.Having been ruled by the Lydian and Persian,Pergamum was taken over by Alexander the Great in 334 B.C. After Alexander's death,one of his generals,Lysimachus controlled Pergamum and much of the Aegean region. After Lysimachus'death, it became the center of a kingdom under Philetairos.Ruled by the kings Attale and Eumene,it was the governing city for all of Western Anotalia.According to the will of King Attalus III,Pergamum becamea part of the Roman Empire after his death in the second half of the 2 nd century B.C.The city experienced its golden age until the end of the 3 rd century A.D. Especially after parchment paper was invented in this city,a library was built containig200,000 volumes and Pergamum became a cultural center of the Roman Empire ,on a par with Alexandria.